A photovoltaic cell or a solar cell is a device that converts light energy (typically sunlight) into electricity. 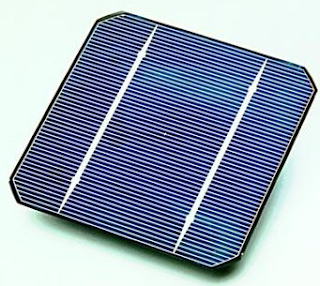 Solar cells are commonly grouped together as modules to form a solar panel to convert enough electrical energy to practically run a device or group of devices. These solar panels convert light to electricity thru the process known as the photovoltaic effect. By tweaking the smallest of parts, a trio of University at Buffalo engineers is hoping to dramatically increase the amount of sunlight that solar cells convert into electricity. The research appeared online last May in the journal Nano Letters. The research team included Vladimir Mitin, Andrei Sergeev and Nizami Vagidov, faculty members in UB's electrical engineering department; Kitt Reinhardt of the Air Force Office of Scientific Research; and John Little and advanced nanofabrication expert Kimberly Sablon of the U.S. Army Research Laboratory. Mitin, Sergeev and Vagidov have founded a company, OPtoElectronic Nanodevices LLC. (OPEN LLC. ), to bring the innovation to the market. The idea of embedding quantum dots into solar panels is not new: According to Mitin, scientists had proposed about a decade ago that this technique could improve efficiency by allowing panels to harvest invisible, infrared light in addition to visible light. However, intensive efforts in this direction have previously met with limited success. The UB researchers and their colleagues have not only successfully used embedded quantum dots to harvest infrared light; they have taken the technology a step further, employing selective doping so that quantum dots within the solar cell have a significant built-in charge. The photovoltaic effect is the creation of voltage or electric current in a material upon exposure to light. Though the photovoltaic effect is directly related to the photoelectric effect, they are different processes. In the photoelectric effect, electrons are ejected from a material's surface upon exposure to radiation. The photovoltaic effect differs in that electrons are transferred between different bands (i.e., from the valence to conduction bands) within the material, resulting in the buildup of voltage between two electrodes. This built-in charge is beneficial because it repels electrons, forcing them to travel around the quantum dots. Otherwise, the quantum dots create a channel of recombination for electrons, in essence "capturing" moving electrons and preventing them from contributing to electric current. The technology has the potential to increase the efficiency of solar cells up to 45 percent, said Mitin, a SUNY Distinguished Professor. Through UB's Office of Science, Technology Transfer and Economic Outreach (STOR), he and his colleagues have filed provisional patent applications to protect their technology. "Clean technology will really benefit the region, the state, the country," Mitin said. "With high-efficiency solar cells, consumers can save money and providers can have a smaller solar field that produces more energy." Mitin and his colleagues have already invested significant amounts of time in developing the quantum dots with a built-in-charge, dubbed "Q-BICs." To further enhance the technology and bring it to the market, OPEN LLC is now seeking funding from private investors and federal programs.